The 10.7 release brings a major update to ArcGIS Business Analyst services and content. After much consideration, discussions with our distributors and partners, and feedback from users, we’ve renamed the solution to ArcGIS Business Analyst Enterprise. 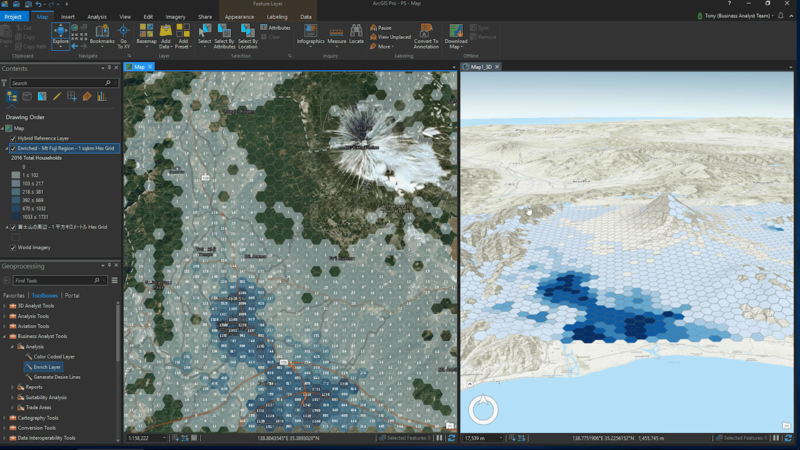 This includes the new ArcGIS GeoEnrichment Server for performing data enrichment, creating reports and infographics, and running other analysis. The ArcGIS GeoEnrichment Server is the next-generation of server software, which gives users a significant boost in performance and a demographic database for mapping and data enrichment. 2013: First generation of GeoEnrichment released in ArcGIS Online. 2016: GeoEnrichment capabilities and the Business Analyst Web App included on-premises with the 10.5 release with Business Analyst Server and ArcGIS Enterprise. 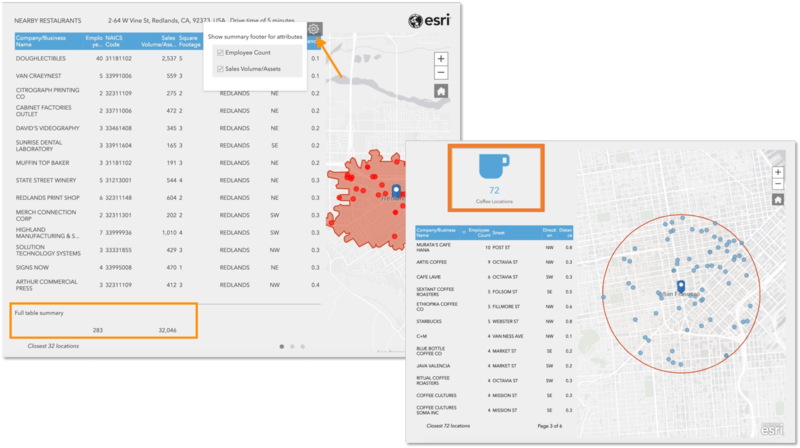 2017: Modernized GeoEnrichment server architecture introduced to ArcGIS Online, improving performance and stability while introducing a central database of demographic content. 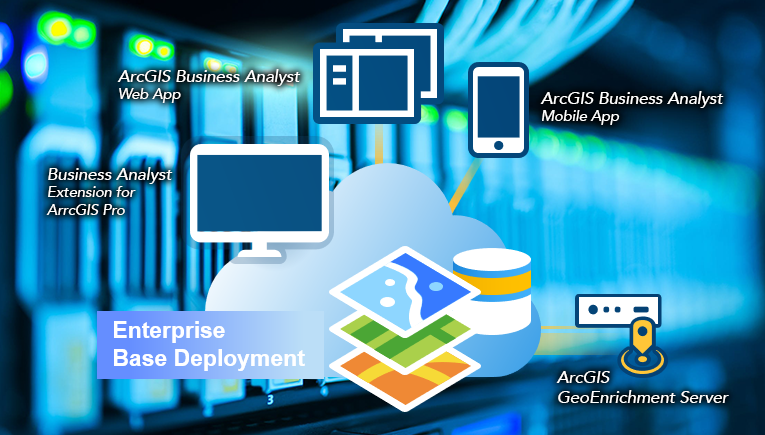 2019: Updated GeoEnrichment Server architecture released with ArcGIS Business Analyst Enterprise. 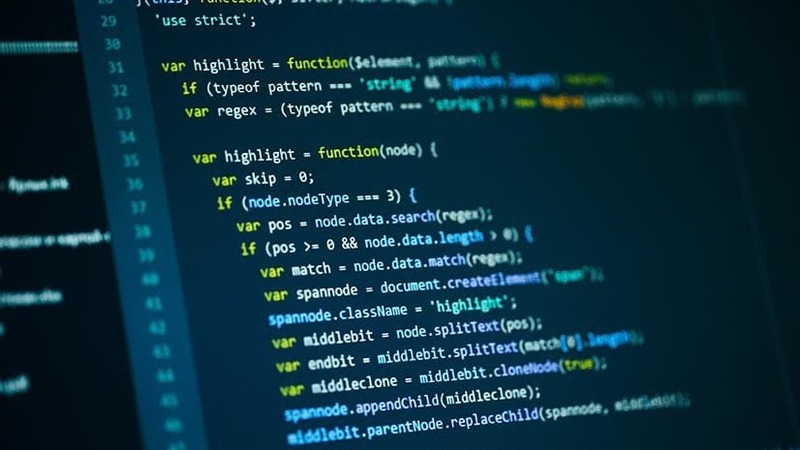 You may be asking, “What’s happening to Business Analyst Server?” With this release, the original Business Analyst Server software has been deprecated, but will still be available to existing Business Analyst Server solution customers upon request. Check out our topic on migration scenarios for more information. 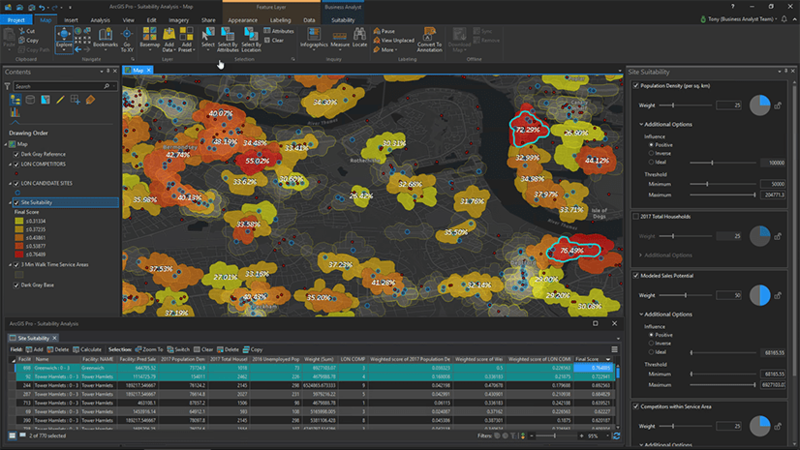 ArcGIS Business Analyst Enterprise provides demographic mapping and analysis in your infrastructure. Your time is valuable. We’re all short on time and busier than ever. That’s why we’ve worked to make Business Analyst faster than it has ever been before. Business Analyst Enterprise offers an enhanced ability to process large requests at much faster response times. The team performed internal benchmarking tests for this release and found a reduction in response time by roughly 80% when enriching 100 features simultaneously to as much as 99% when enriching a single feature. Your other applications that use GeoEnrichment will process and respond faster too! These include the ArcGIS Business Analyst Web App, ArcGIS Maps for Office, and even analysis tools like Enrich Layer in ArcGIS Pro or ArcGIS Online. Business Analyst Enterprise brings faster enrichment than ever before. Color-coded maps provide information about your areas of interest. By adding an ombré color effect (color from dark to light) to your areas of interest at several levels of geography, you can explore patterns and reveal insight with demographic information, consumer spending patterns, and other market conditions. From areas the size of a state down to the block group level, you can quickly identify important patterns in the area you are investigating. Business Analyst Enterprise 10.7 provides feature layers, like color-coded maps, to help you better target new and existing customers or constituents. These feature layers are now published automatically during the data installation; gone are the days of manual data publishing and data copies! You can learn more about color-coded maps by clicking here. 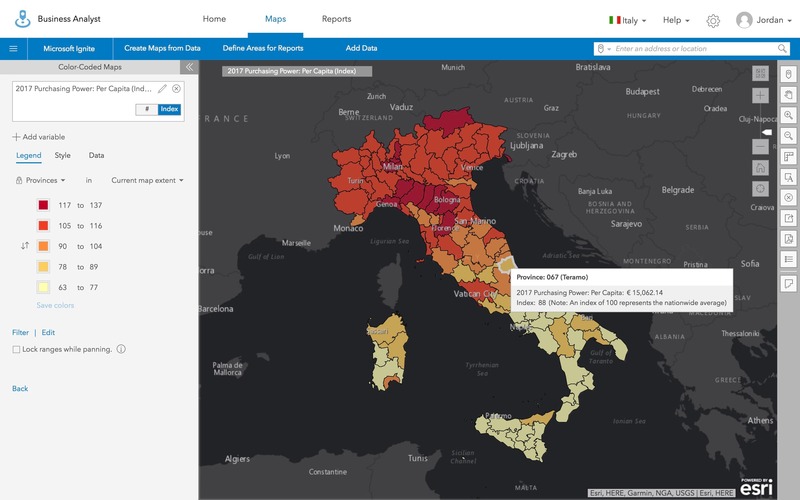 Explore patterns and reveal insight with Color-Coded Maps using Business Analyst. You can read more about creating infographics with a Nearby table and other capabilities here. Display nearby attributes in your infographics using ArcGIS Business Analyst. 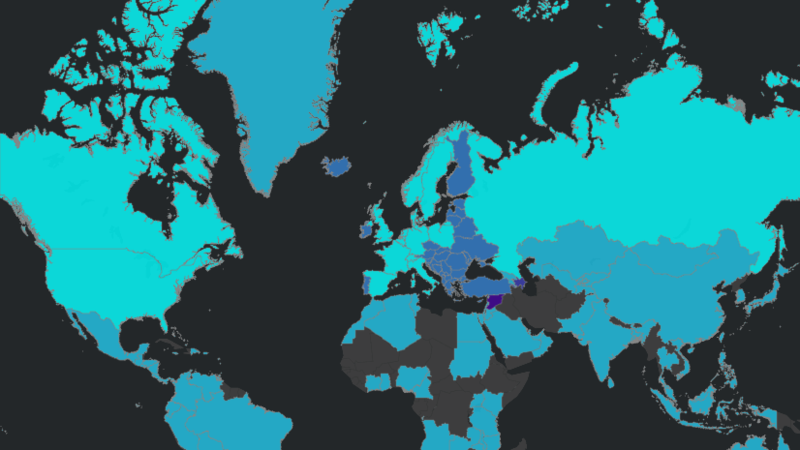 With the 10.7 release of ArcGIS Business Analyst Enterprise, there are now global data options in addition to the content provided for the United States. Via additional licensing, users can purchase regional data packs with coverage for over 135 countries made available by Michael Bauer Research (MBR). You can view the full list of countries here. Global data options are now available for ArcGIS Business Analyst Enterprise customers. We’re so happy to share this release of ArcGIS Business Analyst Enterprise with you. Below you can find some related links that you may find useful. 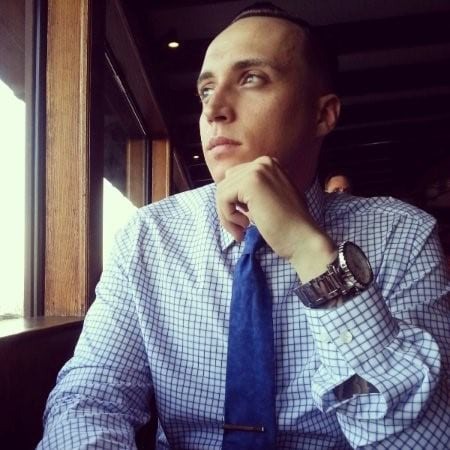 Esri product marketing lead for the ArcGIS Apps team, digital marketing professional, US Army Veteran, MBA. I'm passionate about pursuing my interests in data-driven tech and software marketing, communications, consumer behavior and decision-making, customer relationship management, and all things technology. 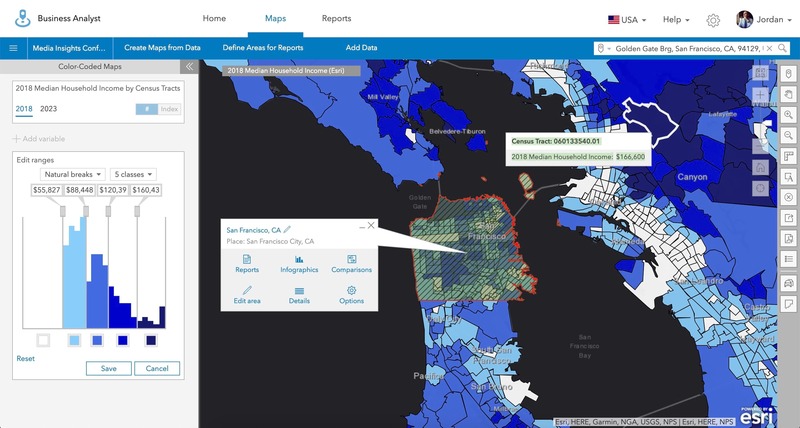 Updates have arrived in ArcGIS Business Analyst Web App including new demographic data, infographic templates, reports, workflows, and more. Tools in Business Analyst for territory design, site suitability analysis, generating desire lines, and creating standard geography trade areas.